Pukka Herbs are Britain's leading organic ayurvedic herb specialists, planting over 1 million plants each year to benefit the land, the integrity of Ayurveda and the health of society. 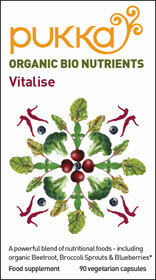 Their range of Organic Bio Nutrients, launched 2009, includes 3 products containing Seagreens® Arctic Fresh Seaweed - Clean Greens, Vitalise, and Weight Balance. Each is a powerful blend of nutritious natural foods for everyday health. Britain’s largest manufacturer of organic quality nutritional supplements, G & G also includes Seagreens® Certified Ingredients in several multinutrient superfood products.